Strengths: Vincio demonstrates outstanding defensive instincts and has the tools to develop into an above-average defender with maturation. His quick first step, footspeed, and anticipation give him plus range, allowing him to cover exceptional ground to both his left or right. Athletic and agile, he is very light on his feet and balanced when making plays in the field. Vinicio shows the type of soft hands that fluidly adjust to the path of the ball, getting his glove in the proper position to eat up grounders hit in his direction. His defensive game is rounded out by a solid-average arm that has the potential to get stronger as he ages. Vinicio’s agility allows him to make off-balanced throws and ones on the run with control. Offensively, the switch hitter shows a fluid, compact stroke from the left- side of the plate. He generates plus batspeed as a lefty and is capable of getting around well on higher velocity fastballs. Despite being behind the curve in terms of physical development, Vincio squares offerings up well hitting left-handed and produces excellent backspin when getting the head of the bat out in front of pitches. The ball comes off his bat well. He has the hit tool to become a solid-average hitter for batting average, with the ability to maintain high contact rates and drive offerings into the gap on a line. Vinicio has the ceiling of a major league regular at the shortstop position. Development Needs: Vinicio is extremely lean. He does not have the frame to evolve into a player whose power is a big part of his game, but needs to focus on adding strength to enhance both his offensive and defensive tools. Vinicio’s right-handed swing suffers due to his lack of strength. Longer than his swing as a lefty, he has trouble getting the head of the bat around on offerings and it drags through the hitting zone. He is behind more pitches, typically carving or slicing the ball against left-handed pitching. Physical development will aid Vinicio as a righty, but he also needs to work on using his hands more to hit inside the baseball and produce line drives rather than trying to air it out. With a power ceiling in the single digits for home run production, maintaining high rates of solid contact is going to carrying his offensive game. Vinicio is presently very aggressive with his pitch selection and does not use the opposite field with frequency. Becoming a more patient hitter is going to be key for his hit tool to develop even with physical development over the course of the next three to four seasons. Vinicio is also over-aggressive in the field, needlessly rushing plays or being too zealous when making throws. This leads to a lot of unforced errors. Slowing the game down is necessary for him to become a more sure-handed fielder, but should come with maturation. 2012 Outlook: Vinicio has spent the last two seasons in the Gulf Coast League. He has been on the young side and has also not been ready for more advanced competition due to his lack of physical development. Vinicio will more than likely stay back in extended spring training again this year, but should receive a placement with the Lowell Spinners to push his skills. He looked much more settled offensively during his time in the Fall Instructional League this past year, handling the advanced competition well. Vinicio will be playing against pitchers three or four years older than him during the season with Lowell. Expect some growing pains, but he has the developing skills to show flashes of line drive hitting potential. I see the more advanced secondary offerings he is going to face giving him trouble initially, but this will be a good challenge for him to adjust and push his selectiveness at the plate. Vinicio is very young, with a lot of development in front of him. The amount he physically matures is going to be a strong driver of his overall progression as a player. He has the type of tools that can translate quickly into in-game production when he begins to catch up physically. 2012 is another season to keep working to polish off his rough edges and build more of a professional approach at the plate. Strengths: Vazquez’s defensive game made strong strides last season. Possessing a sturdy and strong frame, he shows fluid movement from side-to-side when blocking pitches. Vazquez quickly reacts to balls bounced in the dirt, firing his feet to smother the pitch or getting big with his body to keep it in front of him. His footwork has improved from early in his career when his feet would become tangled and he struggled to control pitches in the dirt. Vazquez also is quick with his glove when going after off-line offerings and gives a very firm target when receiving pitches. He minimizes the amount of drift after the pitch hits his mitt. With continued progress learning the finer points of catching as he gets into the upper levels of the minors, he projects as a solid-average-to-better defender at the major league level. Vazquez’s glove can carry him up the ranks of the organization. With a well-filled out body, he has strong forearms and solid lower body strength. Vazquez shows solid-average raw power in batting practice sessions. He’s made improvements quickening up his swing load, with his batspeed grading as a slightly better than average. This has helped Vazquez get around better against fastballs middle-to-in and create more solid contact in the process. With more cleanup work to his swing load, he can project as about an average hitter for batting average. Development Needs: Vazquez has a plus arm, but is still working on improving how he pops out of the crouch. He tends to be a bit slow with his release, which neutralizes his arm strength. His feet can also get tangled because he rushes and his accuracy suffers as a result. Vazquez has the ability to control the run game, but has to find a technique that fits to be more fluid when throwing. As he progresses into the upper minors he will also need to become more comfortable with being vocal out on the field and taking charge. At times, he can sit back a bit too much. Without great batspeed, Vazquez’s continued improvement quickening up his swing load will be vital to progress against the advancing level of competition. Fastballs above the belt can give him trouble. If he has to starts cheating by opening his lower body early to compensate, pitchers will take advantage of it with breaking balls. This will leave him more of a fringe-average hitter, with reduced zones for making solid contact. Incorporating his hands more into his swing will also aid with hitting inside of the baseball to take advantage of the whole field rather than relying on constantly pulling the ball to make hard contact. Vazquez may not tap fully into his power by adjusting, but maintaining adequate contact rates will give him a better shot at projecting as more than a backup at the major league level. 2012 Outlook: After more limited playing time prior to last season, Vazquez took advantage of his starting role with Greenville in 2011. He looks set to receive a placement in High A after the end of spring training. First and foremost, defense is a strong attribute for Vazquez. This season will serve as continued learning to assert himself during game action and more repetition with cleaning up his throwing mechanics. Improvement controlling the running game will continue to push him as a defender capable of handling the position at the major league level. His assignment with Salem also gives him further experience handling a pitching staff in preparation for entering the upper levels of the organization. The Carolina League can be a difficult offensive environment. The opposing pitchers show a lot more polish than the relatively inexperienced ones in the South Atlantic League. This will be a good challenge for Vazquez to adjust and continue working to quicken up his swing load. With less mistakes made, he will have to hit more at this level. There will most likely be a drop in power output, but maintaining similar contact rates to last season would be a good sign he is making progress adjusting. 2012 is a year to follow up his development strides and show he is pushing towards being ready for Double-A in 2013. According to Tim Britton of the Providence Journal, first baseman Mauro Gomez has been reassigned to minor league camp after arriving late to spring training due to visa issues. Gomez, 27, was signed by the Red Sox earlier this month as a minor league free agent. He figures to see significant playing time in Triple-A Pawtucket after hitting .304/.356/.522 with 24 home runs and 90 RBI in 135 games last season for Triple-A Gwinnett (ATL). 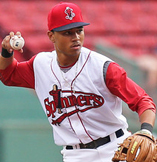 2012 Outlook: Betts is likely to stay back in Florida for extended spring training and then play with the Lowell Spinners in the New York-Penn League when the season starts in June. Betts shows a compact, level swing. He uses his hands well to hit inside of the baseball and quickly pulls them in against fastballs on the inside third. He has the type of swing to produce a lot of contact, but will need to begin developing his approach and pitch recognition to allow his hit tool to show. Betts will be challenged during his assignment in Short-Season ball by the more advanced pitching he is going to see. Secondary offerings are likely to give him trouble early in the year. Betts’ best tools are his speed and defensive ability. An excellent athlete, he is capable of impacting a game with his legs. Once on base, he should be able to steal bases frequently at this level. Betts projects as a future above-average base stealer. A shortstop in high school, he worked as a second baseman during the Fall Instructional League. He is very fluid and smooth defensively, with a solid-average-to-better arm. Betts will be able to come up to speed at second quickly. This season he is set to begin the initial development stages and build experience as a professional. 2012 Outlook: Developmental strides have been on the slow side for Renfroe. He looks likely to return to Greenville in 2012 for more seasoning. Renfroe’s pitch recognition is still on the rough and raw side. He struggles to pick up secondary offerings out of opposing pitchers’ hands. This causes the vast majority of his inconsistency making solid contact. Renfroe is typically either out on his front foot or bailing against breaking balls. Rarely does he do anything other than swing-and-miss or weakly put them in play. His swing has looked choppy and lacked fluidity because he hesitates to attack offerings. This season is big for him to show improvement with his ability to make contact. He has plus raw power, but his troubles squaring the ball up with backspin do not let it translate into game action. A second go-around in the South Atlantic League will give Renfroe a chance to be more comfortable against the level of competition he is facing. He has been pressed and behind the curve in his first two seasons. With a strong crop of infield talent in the lower levels of the organization, 2012 is a year for Renfroe to show that he is taking steps forward with his overall game. 2012 Outlook: De La Cruz has an inside track at breaking camp with the Greenville Drive and getting consistent playing time in the outfield. While he improved on being more relaxed in the batter’s box over the course of last season with Lowell, he will need to continue focusing on being more disciplined in Greenville to make consistent contact. De La Cruz has some pop in his bat and by being more selective can improve the frequency he produces extra-base hits this coming season. Adjusting to the level of competition is going to be a challenge though. He could start off slow in 2012 as he finds his footing. De La Cruz also has some upper-cut in his swing that can stand to be leveled off. He has a tendency to come through the hitting zone, underneath the ball and create too much topspin. Ironing this out will give him a better chance to project to make enough contact in higher levels. De La Cruz’s biggest asset is his defensive ability. A natural center fielder, he gets excellent reads off of the bat and covers both gaps well. He should continue to prove to be a solid defender in 2012. This year’s assignment in full-season baseball will serve as a proving ground for De La Cruz to show that he is trending towards becoming a more polished hitter and ready to take the next step up the ranks to start 2013. 2012 Outlook: Marquis looks likely to receive a placement with the Greenville Drive to start the 2012 season after showing a more developed approach at the plate than many of his peers during his time with the Lowell Spinners last season. A solid athlete, he moves well in the outfield and can play either of the corner slots more than adequately. His arm can play up in right field and he makes accurate throws to the bases. Offensively, Marquis has some leverage in his swing and can drive fastballs middle-to-in with backspin. His patience at the plate should allow him to adjust relatively quickly to the South Atlantic League. Given the inconsistent nature of opposing pitchers’ command at this level, he will most likely take his fair share of walks and find himself able to work into favorable counts. One area Marquis needs improvement with is his handling of secondary offerings. He tends to loop around the pitches with the head of the bat when he attacking them. This may not hinder him too much at the A Ball level from making a lot of solid contact, but he will have to eliminate the jerk in his swing to be successful against more advanced pitching. This season will give Marquis his first taste of the long professional season and how to handle the grinding nature of it. Jose Iglesias has his eye on the Red Sox starting shortstop job according to Joe McDonald of ESPNBoston. SoxProspects Editor-in-Chief Mike Andrews is now projecting Iglesias to win the job. He believes that Iglesias will be the type of player who develops better on the job. Take a look at full roster projections for 2012 here. New manager Bobby Valentine talks about Iglesias, including the differences between him and Rey Ordonez, who Valentine managed with the New York Mets in this report by Alex Speier of WEEI.com. While Peter Abraham of the Boston Globe notes that he looks stronger. Speier spends time with new pitching coach Bob McClure breaking down some of the pitching depth that will likely fill out the back of the rotation or start the season with Pawtucket. Brian MacPherson of the Providence Journal reports that pitcher Aaron Cook does not mind delaying his start to the season due to a sore shoulder. Pitcher Ross Ohlendorf went through fielding drills at half speed due to a sore back, notes Abraham. Speier provides further details on the health of Ohlendorf and Cook. Coming off a season of injuries and ineffectiveness, this is an important spring training for left-hander Felix Doubront as he is out of options and is trying to win a job with the big club. MacPherson talked to Doubront, who says he's feeling good coming into camp this year. Right-handed pitcher Stolmy Pimentel suffered a lat injury on one of the first days of camp. Tim Britton of the Providence Journals reports that Pimentel hopes to be back in a couple of days. He is looking to rebound after a difficult 2011 campaign between Portland and Salem. MacPherson pens a piece on swingman Clay Mortensen who was acquired in the Marco Scutaro trade. He had an eventful month of January in addition to being traded. With Red Sox fans and media talking about the Scutaro trade being a pure salary dump, Mortensen is out to prove his worth to the Red Sox according to Speier. Carlos Silva is blessed to have the chance for redemption this spring, writes Britton. Newly acquired pitcher Chris Carpenter arrived at Red Sox camp in Fort Myers on February 23. Joe McDonald reports that Carpenter is comfortable in a relief role. Salem Red Sox broadcaster Evan Lepler reports that outfielder David Mailman retired and has enrolled at the University of South Carolina. Mailman was a 7th round draft pick in 2007 and signed for $550,000. In his final professional season, Mailman hit .212 in 260 at-bats for the Salem Red Sox. Former lefty prospect Hunter Jones has signed and is in Red Sox camp, reports Speier via twitter. Rich Hill was added to the 40-man roster on February 22 as he has impressed in his recovery from Tommy John surgery and had the option to opt out of his contract in late March. Gordon Edes of ESPNBoston notes that left-handed pitcher Daniel McGrath who was signed out of Australia on February 7 is in Fort Myers for a couple of days before he returns home to finish school. In that same report, Edes says that sources tell him the Red Sox are keying in on 19-year old Cuban outfielder Jorge Soler. Scott Atchison understands the business of baseball, writes Steve Buckley of the Boston Herald. Zach Kapstein took Josh Beckett deep in live batting practice, as noted by Britton on Twitter. Jonathan Singer is the Digital Correspondent for SoxProspects.com. Follow him on Twitter @Jonathan_Singer. Staff Writer Jim Crowell of SoxProspects.com also contributed to this report. Follow him on Twitter @CrowellJim. Strengths: An extremely graceful athlete, Lin displays outstanding defensive instincts in center field. He gets excellent reads off the bat that allow him to make difficult plays in either of the gaps look easy. Lin’s plus closing speed and instincts give him well-above average range in center. Very fundamentally sound, he typically takes ideal routes to the ball and rarely looks pressed when tracking flyballs down. Rounding out Lin’s defensive game is a plus-plus arm that has shown improving accuracy with each year of professional experience. He has developed better body control when throwing and also learned to not rush things when taking a shot at nabbing an advancing runner. Offensively Lin excels with his plate discipline and strike zone management when in the batter’s box. He has a plan in place during each at-bat. He rarely chases a pitch outside of his strike zone and picks up breaking balls very quickly. Lin demonstrates the type of bat control to spoil pitches in tough spots, allowing him to stay alive in counts. Once reaching base, his plus speed and work improving reads off of opposing pitchers project him to capable of stealing around 25 bases in a season at the major league level. Development Needs: While Lin works himself into good hitter’s counts and displays sound discipline at the plate, his ability to consistently drive offerings in those situations has been lacking. His swing is short and compact, but often hits the ball off of the trademark or end of the bat instead of the sweet spot. Balls tend to die off his bat with little backspin. When Lin does drive balls, he is typically opening up early and guessing fastball to get the head of the bat in front. Cheating like this will leave him susceptible to experienced pitchers working him away with hard breaking balls consistently. Lin must improve with the frequency he makes solid contact to produce enough line drives to maintain an average-to-better batting average at the big league level. His power does not factor to be a big part of his game, projecting as well below-average. His ability to make hard contact is crucial to being able to take advantage of his on-base skills as well. Right now he gives opposing pitchers no reason not to challenge him. Overall, Lin’s bat is very light and his batspeed has not been translating with the increase in level of competition. 2012 Outlook: Added to the 40-man roster this past November, Lin will get a chance to participate in the major league camp before getting sent back at some point in March. This experience should be a good spring board into his season in Triple-A. Lin can more than handle center field defensively in the big leagues right now and should be a plus-to-better defender as he continues to slow things down in the field. The key for 2012 is showing that he can make more consistent hard contact. Lin will not strike out that frequently and will draw his fair share of walks with Pawtucket this season. It comes down to how much he can improve driving the ball to produce more line drives rather than an abundance of flares or weak grounders at this level. A rise here will prove he can be a threat to hit his way onto base as well as use his batting eye to do so. I see Lin as a future bench player at the big league level, providing late inning defense or pinch runner duty, along with drawing the occasional start with offensive progress in 2012. He also serves as outfield depth for the Red Sox this season and could see some time with the club if an injury depletes the bench or during a cameo September call-up appearance. Strengths: Ramirez brings a strong mound presence to his outings and an understanding of how to pitch. He features an 89-92 mph fastball, with which he displays solid-average command. Utilizing both sides of the plate well, Ramirez moves his heater around the corners of the plate and is able to throw to all tiers of the strike zone. The offering is most effective in the lower portion of the zone between opposing hitters’ knees and thighs. Ramirez can reach back and touch 93 mph when needing a little something extra on his fastball to elevate against an opposing batter. His best offering is an 82-84 mph changeup. Showing strong diving action, this pitch drops quickly off the table to disappear out of the hitter’s line of sight. It can also tumble similar to a split-fingered fastball. Ramirez leans on his change to produce outs and swings-and-misses. It projects as a plus pitch. His ability to use it at any point in the count also enhances his fastball. When mixing it into sequences, the deception and change in speeds gives his fastball the appearance it is coming in harder than it is. Ramirez has the feel for when to play both of the pitches off of each other and vary his patterns to keep hitters off-balance. A polished pitcher out of college, he should adjust quickly in his professional career. Development Needs: Ramirez will be the type of pitcher as he gets further into his professional career that will have to rely heavily on his command and control. He will have to be fine with his fastball due to the lack of overpowering velocity. In order for his heater to be effective against more advanced hitters in the minors, he needs to push his command by honing his ability to repeat his release point. Becoming more consistent with it will allow Ramirez to spot frequently on the corners and pound strike zone early in counts. He cannot afford to leave the ball up in the strike zone and in the middle of the plate. His slider is presently a fringe-average offering that lacks enough depth to fool hitters. A sharper breaking slider gives Ramirez an option to use against right-handed batters to keep them honest on the outside third of the plate. They will sit all over his fastball in this area if he cannot learn to snap his slider off so it darts down into the dirt. Development of this pitch into a more reliable one is a key need for being able to stick as a starter once he enters Double-A. 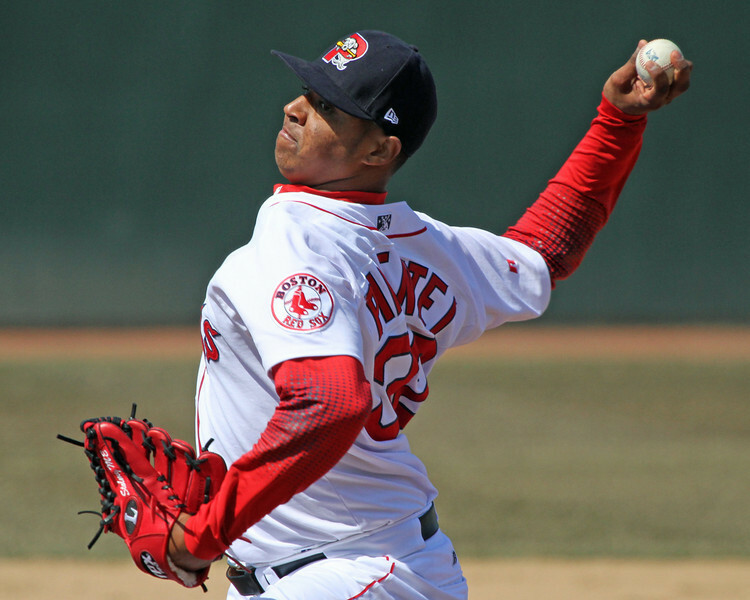 Given Ramirez’ overall repertoire, he has the look of a reliever at the major league level. 2012 Outlook: Ramirez is set to begin his first spring training as a member of the Red Sox organization. Having not pitched last year after signing, there will be some adjustments to pitching in the five-man rotation, but an assignment to Greenville will help ease him into the transition. Taking his experience and polish into account, he looks likely to be ahead of the level of competition as he starts to find his footing. He should display solid control and limit the levels of hard contact made against him in the South Atlantic League. The time spent in A-ball is also a good opportunity to work on honing his fastball command and crispness of his slider for when he begins to face more advanced hitters. If his placement in Greenville is not providing enough of a challenge, there is a good chance that Ramirez will receive a promotion to High A around mid-season. While he is more likely to have his stuff fully tested when reaching Double-A, the bump up in competition faced in the Carolina League will push him to hit more spots and leave less margin for error. This year serves as a season to hone his overall arsenal and get used to the rigors of pitching in the long professional season. As reported by WEEI.com’s Alex Speier, the Red Sox have signed left-handed reliever Hunter Jones to a minor-league contract. He is back with the organization after a two-year absence. Jones, 28, was originally signed by the Red Sox in 2005 as an amateur free agent out of Florida State University. 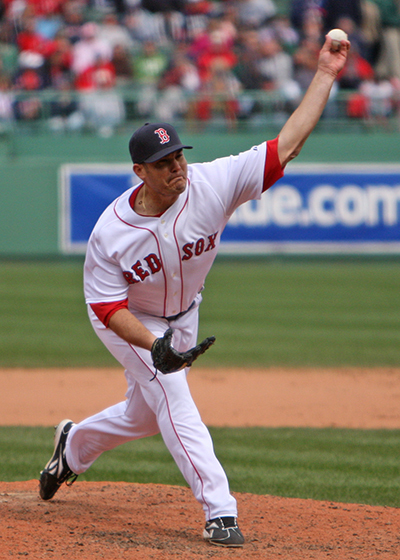 He spent five years in the Sox system, reaching the majors for 11 appearances in 2009. Despite being undrafted due to concerns about an arm fracture suffered in college, Jones had success in the minors. In 2008, SoxProspects.com ranked him as high as the #14 prospect in the system. Jones split that season between Double-A Portland and Triple-A Pawtucket, making 48 appearances out of the bullpen, compiling a 7-3 record, a 2.45 ERA, and an impressive 9.3 K/9 against only 2.2 BB/9. He made his major league debut on April 20, 2009, pitching a scoreless ninth inning to finish a 12-1 win against the Orioles. After the 2009 season, Jones was traded to the Florida Marlins along with Jose Alvarez in exchange for Jeremy Hermida. He injured his left elbow on June 5, 2010, requiring Tommy John surgery. Jones was released by the Marlins later that season, and spent the 2011 regular season rehabbing. He returned to the mound in the Venezuelan Winter League, making four appearances for Aguilas de Zulia. Jones is likely to begin the 2012 season with Triple-A Pawtucket. Who will be the breakout prospects for the Red Sox in 2012? That's a question that I've heard quite often lately. To me, "breakout prospect" can be defined in a few ways: You have players who break out from top-prospect status to elite blue-chip status, players who break into the top 100 prospects in all of baseball, and players who burst onto the scene from out of nowhere. Without currently having any surefire "blue chip" prospects in the organization, breakout potential may be the greatest strength of the Red Sox system right now, as there are several players in the system who could make a big leap in 2012 given the right development path. Keep in mind, however, that I'm not projecting that every one these players will have such a breakout season -- I'm only saying that each of these players is capable of a breakout. The most likely scenario, as is the case with most years, is that a few of these players will have breakout seasons, others will follow a level development path, and others will take a step back. That being said, here's a look at 10 breakout candidates in the Red Sox system for 2012. Check out the full column at ESPN Boston. Strengths: Balcom-Miller’s bread-and-butter offering is his heavy, sinking fastball. Sitting 88-90 MPH, he gets solid leverage when throwing his heater to generate outstanding downward movement. This pitch rarely comes in straight. Balcom-Miller can also create arm-side run, with it tailing in on right-handed batters’ hands. Due to the movement and sinking action, opposing hitters have a tough time elevating the pitch when it is in the lower tier of the strike zone. Balcom-Miller can control stretches of game action by effectively spotting his fastball on the corners of the plate. After establishing his heater, he then leans on an improving 81-83 MPH changeup. Displaying bottom dropping action, this offering keeps hitters off-balance and provides enough separation in velocity that hitters tend to lunge out in front of it when mixed appropriately in sequences. Balcom-Miller’s change has made strong strides since turning pro. The pitch can round into a solid-average secondary offering with continued work syncing the arm-speed produced with that of his fastball. Showing a tough and confident demeanor on the hill, he is not afraid to pitch inside when necessary or come right after batters to get out of jams. Balcom-Miller’s ceiling is a back-end of the rotation starting pitcher. Development Needs: Balcom-Miller’s fastball command needs refinement, grading as about average presently. His sinking fastball tends to have a mind of its own. He struggled reeling the offering in against more advanced hitters, laboring more through innings due to batters taking the pitch instead of chasing the movement. Balcom-Miller’s optimal starting point with the fastball rests at about the thighs, where opposing hitters will commit to swing since it looks like it is coming down the middle of the plate. He walks a fine line when placing it since hitters will take when it does not start high enough to be judged a strike, but is easier to make solid contact against when coming in at the belt. Development of a better feel for his release point is critical to being successful against polished hitters. Balcom-Miller also lacks a major league swing-and-miss pitch. While his changeup has made strides, it is designed to produce weak contact like his fastball. His 80-82 MPH slider is presently a below-average offering, floating across the strike zone rather than breaking sharply out of it. There is not enough depth for hitters to be fooled and it sits in the hitting zone waiting to be elevated. Honing of this pitch is necessary to give him a third viable option to churn through opposing lineups. 2012 Outlook: Balcom-Miller looks set to return to Double-A to show that he can make adjustments this season to get hitters out more consistently in the Eastern League. Expect him to continue to work in the rotation to hone his repertoire. Balcom-Miller’s fastball can be a highly effective offering for him. With improvement commanding the ball on both sides of the plate, he should reduce the amount of solid contact made against him. Progression in this area will also enhance his changeup. While I expect Balcom-Miller to fare better as a starter this season due to experience and repetition, his path to the big leagues lies as a reliever. He expends a lot of energy with his delivery and when forced to work harder in innings his stuff starts to diminish quickly. He projects as a potential 6th or 7th inning reliever on a contending team with progress developing more crispness and overall command of his arsenal in 2012. Balcom-Miller can push as a back-end starter on a second division team with strong gains improving his slider, but his delivery makes him ideally suited for getting 3-4 outs and that role will also allow his stuff to stay consistent. Strengths: Linares utilizes a compact swing that is quick to the point of contact. Generating solid-average batspeed via strong wrists, he is an excellent fastball hitter, especially against ones on the inner third of the plate. Linares’ short swing allows him to get the head of the bat around on high velocity offerings. He has the potential to produce average-to-solid-average contact at the major league level and projects as about a .270 hitter for batting average. Strong for his size, Linares can put a charge into the ball when squaring it up. He has learned to create lift with his swing and elevate the baseball using his wrists. Linares’ power ceiling can reach 12-14 home runs with experience hitting at the big league level. Despite having a stocky build, he has deceiving speed. This serves him well in the outfield along with his instincts for reading the ball quickly off the bat. Linares covers slightly above-average ground in center field and can play left or right field more than adequately. While only possessing average arm strength, he shows a quick release and solid positioning when lining up to make accurate throws to the bases. Development Needs: Linares lost almost the entire 2011 season to an ankle injury and still has not been tested against advanced secondary offerings. Although experienced coming over from Cuba in 2010, it remains to be seen whether he can hit the caliber of breaking balls seen in Triple-A and then the major leagues. Linares can also be too aggressive at the plate, lacking the discipline to take offerings out of his hitting zones. He hits fastballs well, but will chase elevated ones above the belt and try to pull ones away from him. There is a bit too much hook in his swing, which leads to fly balls with topspin and an over-dependence on pulling the ball to drive it. In order for Linares to produce enough contact, he must look to use the whole field more to increase the hitting areas in which he is a threat to do damage. Pitchers will also consistently feed him a diet of fastballs and secondary offerings away if he does not adjust his approach. Linares is a good defensive player, but does not have the footspeed or range to play center field in more than a fill-in role. Without front-line power or plus hitting potential, his ceiling is as a major league bench player, filling a fourth or fifth outfield slot on a roster. 2012 Outlook: Linares has an outside chance at winning a reserve outfield slot with the big club out of Spring Training, but more than likely slots as one of the starting outfielders on the Pawtucket squad. 2012 is an opportunity to play a full season as a professional and show that he is ready to contribute if the need arises at the major league level. It may take some time for Linares to get his timing back against live pitching given he only ramped back up during the Fall Instructional League and saw limited action out in Arizona, but his hitting talent is in line with the competition he will face in Triple-A. A positive sign that he is adjusting quickly will be an improvement with his patience at the plate, which will help drive frequent instances of solid contact in Triple-A. Linares will definitely be challenged by secondary offerings if he starts jumping all over fastballs early in the season. If he can work more consistently to the opposite field to mitigate opposing pitchers working him away with frequency, I see him rounding towards being ready for a potential look with the big league club around mid-season. Roster openings are dependent on a lot of factors, but over the course of the long season the major league team always ends up reaching down for players capable of answering the call. Linares provides the organization with outfield depth in 2012 and can end up as one of those players that seems to come out of nowhere to contribute. The Red Sox announced today that they have put right-handed pitcher John Lackey on the 60-day disabled list and added left-hander Rich Hill to the 40-man roster. Tuesday was the first day that teams could place players on the 60-day disabled list. Hill had started to show promise as a left-handed reliever last season, throwing 8 shutout innings with 12 strikeouts in 9 appearances before having his season end prematurely due to injury and subsequent Tommy John surgery. Hill's low arm slot makes him very difficult for left-handed hitters, but he tore through batters from both sides in his short major league stint, allowing just 3 hits to the 30 batters he faced. He has already started to throw bullpens, but is unlikely to see any Spring Training game action as he continues a regimented recovery from his June surgery. He currently has a streak of 15 consecutive scoreless appearances in tact to begin his Red Sox career, a team record. Lackey suffered through a tumultuous 2011 season on the field, where he went 12-12 with a 6.41 ERA before having his season end following Tommy John surgery. He is expected to miss all of the 2012 season, so his addition to the 60-day disabled list today was no surprise. The long-awaited announcement of the Red Sox' "significant compensation" for allowing General Manager Theo Epstein to become President of Baseball Operations for the Chicago Cubs was announced on Tuesday, exactly four months after Epstein's departure was officially made public. The Sox will receive right-hander Chris Carpenter from the Cubs, and in addition the clubs will swap players to be named later. Although the two clubs had submitted proposals to Commissioner Bud Selig, Red Sox General Manager Ben Cherington told reporters that the clubs worked out a deal without the aid of the commissioner's office. Carpenter, not to be confused with the Cardinals Cy Young winner and Exeter, N.H. native of the same name, made his major league debut last season, throwing 9.2 innings of relief over 10 outings, allowing 3 runs on 12 hits and 7 walks, striking out 8. After spending the first three seasons of his career as a starter, Carpenter moved into the bullpen at age 25 last year. The Bryan, Ohio native was the Cubs' third-round draft choice in the 2008 draft out of Kent State, climbing quickly to Double-A in his first full season. Carpenter battles significant command and control issues, evidenced by his 23 walks in 30.1 Triple-A innings last season. He has a live arm, however, working in the high-90s and touching 100 mph as a reliever. He also throws a mid-80s slider as well as a changeup. All scouting outlets agree that harnessing his control will make the difference between him becoming a solid late-inning reliever or not. Carpenter will compete for a spot in the Boston bullpen during spring training, but could be optioned to Triple-A Pawtucket to continue working on his command. As for the players to be named later that will be exchanged by the clubs, Cherington told reporters that he and Epstein have agreed on the level of players that will be exchanged, and that he expects the trade to be completed by the end of spring training. To make room for Carpenter on the 40-man roster, Boston placed right-hander Bobby Jenks on the 60-day disabled list as he continues recovering from a number of off-season health issues. Strengths: Hassan displays excellent control of the strike zone and strong plate discipline. He typically grinds through at-bats, methodically working to get an offering he can drive. Hassan shows solid pitch recognition, which allows him to sit back comfortably on breaking balls. While his swing is on the long side, he compensates for it by crowding the plate and choking up on the bat depending on the situation in the count. His confidence in his strike zone management skills allow him to spoil tough pitches with two strikes or take a strike in a hitter’s count if it's not in the area he was zoning in on. Hassan has improved quickening up his swing load. This has helped him get the head of the bat out in front of higher velocity fastballs with more frequency and drive pitches on the inner third. He projects as an average-to-solid-average hitter for batting average with continued experience against upper level pitching. Hassan slots in as a corner outfielder defensively. His plus, accurate arm is his biggest asset in the field. Hassan charges balls well and also does a good job of setting himself up in throwing position to release the ball quickly. Development Needs: While Hassan has natural strength and a well-filled out frame, he has to learn how to tap into it further if he is to produce consistent power at the major league level. He hits mostly with his upper body and arms, unable to get a lot of drive from his lower body to create leverage with his swing. Hassan has been improving with muscling up on the ball in favorable counts though. He also tends to create too much topspin when squaring fastballs up, which reduces the amount of carry he gets on drives. His power projection looks to be about average. Hassan covers the plate well with his swing, but at times struggles with outside fastballs. He carves these offerings to the opposite field rather than driving them. The early extension in his swing makes it difficult for him to stay inside of the baseball and he typically slices balls out-and-away from him. This bears watching as the caliber of pitching keeps increasing. Hassan looks better suited for left field defensively. He is a fringe-average runner and does not have the footspeed to cover a lot of ground in the outfield. His defensive ceiling is that of an average left fielder. Hassan’s bat will have to carry him to stick on a major league roster. 2012 Outlook: Spring Training will be a strong determining factor in where Hassan is placed to start the 2012 season. While he handled the Eastern League well in 2011, there is competition for spots on the Pawtucket roster and some outfielders in front of him more ready to serve as depth to the major league club. Wherever Hassan is assigned to start the season, expect him to continue to bring his grinding approach to the plate. This is his greatest asset and enables him to produce high contact rates. I would expect Hassan to pick up right where he left off if he returns to Double-A for the season. He looked ready for the next step at the end of the 2011 season. Hassan’s test will come when he reaches Triple-A and whether he can continue to adjust to maintain his contact rates. This is big for him due to his limited defensive value. His ability to stick on a big league roster will be driven by his offensive value and showing it in Triple-A will prove he is ready for a look. Hassan projects as a bench player at the major league level. With more improvement generating power in 2012 and continued strong contact rates, he can push that towards a projection as a second division starter. Strengths: Montas has a sturdy frame and a strong lower body that allows him to get solid drive during his delivery. Throwing from a ¾ arm slot, his fastball operates 95-98 MPH and tops out at 100 MPH. Montas possesses excellent arm strength. When in the lower reaches of his velocity, his heater shows some late tail and downward movement, but exhibits ride and explodes on hitters when he reaches back. His fastball also has late life in the lower tier of the strike zone. It does flatten out in the upper tier of the strike zone, but hitters will have a tough time getting on top of the ball due to the plus-plus velocity he generates. His fastball has the potential to develop into an elite pitch as he learns to command the offering. Montas has the ceiling of a closer at the major league level. He looks ideal throwing in short bursts, where he can over-power hitters with his fastball and mix in secondary offerings. Development Needs: Montas is very crude and rough on the mound. Both his command and control are below-average. He will be prone to spells of wildness as he works to iron out his delivery. Montas tends to jerk his head off target when throwing his fastball. This causes him to lose sight of where the pitch is going and miss spots consistently. He is presently very much a thrower out on the mound. He will need to learn how to spot up with his heater and control the pitch if he is to make strides during his initial exposure to the lower levels of the Red Sox organization. Montas also throws a mid-80s slider, but the pitch is very raw. It lacks tight rotation and depth, spinning flatly up to the plate. While he may get by against inexperienced hitters in short-season with his slider because of the difference in velocity from his fastball, the offering needs to get much tighter to be effective against the more advanced hitters in full-season baseball. 2012 Outlook: Montas will get his first experience with baseball in the United States this season. Expect him to participate in Extended Spring Training before playing in the Gulf Coast League. The instruction time down in Florida will be a good transitional period for Montas. Besides getting a chance to work on smoothing out his delivery and sharpening his slider, it allows him time to adjust to the new environment and culture before jumping into game action. 2012 will most likely be a year of subtle progress for Montas. I do not expect him to suddenly burst onto the scene or put up performance numbers that are going to jump off the page. He is just learning how to pitch. Gradual improvement with his command and control as he pitches in game action is reasonable. Montas may also struggle for stretches in 2012, especially if he is falling into patterns of wildness. The progress he can make tightening up his slider will help him begin to get comfortable with mixing pitches during sequences. Montas has an outstanding arm and has power reliever potential. This coming season is a chance for him to start polishing his stuff and taking steps towards becoming a more refined pitcher. Time for one last clean-up edition of First Take before pitchers and catchers officially report on Sunday. Even after the departure of former international scouting director Craig Shipley, the Sox showed they still have a presence in Australia with the signing of 17-year-old Aussie McGrath for a reported $400,000 signing bonus. McGrath, the youngest player to play in the Australian Baseball League, will come to Fort Myers this spring to check out the facilities, but he will finish high school this year and won't report to the club full-time in 2013. In case you're curious, that is standard procedure for past Sox signings out of Oceania. McGrath won't come to camp until 2013, so be prepared to forget about him for a little bit. However, McGrath is a another great example of why building a presence in an area can pay dividends down the road, as he appears to be the highest-ceiling Aussie the Sox have signed. But back on topic, Ohlendorf has pitched exclusively as a starter for the past three-plus seasons for the Pirates after breaking in with the Yankees as a reliever, and there is little reason to think that will change. His numbers during that period aren't shimmering or anything, as he walks too many guys and doesn't strike out enough (3.1 BB/9, 6.0 K/9 from 2009-2011). He's coming off an injury that he says hampered him for nearly all of last season, so this is another low-risk, medium-reward signing by the Sox to add to the Great Spring Training Rotation Competition. To be frank, his chances may hinge on whatever opt-out clauses he may or may not have in his contract - the guys that can leave first tend to get the first shots, all other things relatively equal. I like the signing from a practical standpoint, but could see him holding down a rotation spot in Pawtucket just as easily as I could see him making it to Boston at all this year. Neat side note: Ohlendorf wrote his senior thesis at The-School-Which-Shall-Not-Be-Named on an analysis of the MLB Draft. Pretty neat stuff, which you can check out in this article by ESPN's Tim Kurkjian. Throw another log into the rotation competition fire. Ohlendorf joins Daniel Bard, Alfredo Aceves, Vicente Padilla (if he's coming to camp? ), Aaron Cook, and Carlos Silva among those with a legitimate shot at winning a starting job this spring, perhaps with Andrew Miller, Brandon Duckworth, and Felix Doubront as darkhorses. Forgive me, like Jason Repko last time, I appear to have missed another minor league free agent signing in 29-year-old Josh Kroeger. However, I deny fault, as the Red Sox apparently missed it too - his 1/13 signing is strangely coming up last chronologically for January on their own transactions page, making me think they went back in and added it later, as I had not seen anything on this until he was listed on the non-roster invite list this week. Kroeger's major league experience consists of 24 games with Arizona way back in 2004, back when I was in college learning to hate Princeton. (Have I mentioned that I hate Princeton?) He'd spent his whole whole career with the D-Backs from his selection in the fourth round of the 2000 draft to that year, but since has bounced around to the Phillies, Cubs, White Sox, and last year, Marlins organizations, looking for another shot. Although looking at his Triple-A stats is tough, given he has mostly played in the hitter-friendly Pacific Coast League, he still showed a good deal of pop in his three International League seasons in 2006, 2009, and 2010, putting up between about a .160 IsoP in each season. That said, his on-base skills have fluctuated greatly depending on league, never topping a .319 OBP in the IL even though he's had three seasons above .370 out in the PCL. Defensively, he can play all three outfield positions and first base, not really having a consistent home in any spot the past few seasons after coming up primarily as a right fielder. In Pawtucket, Kroeger would provide depth at first base and in the outfield. I mentioned last time that the Mauro Gomez signing shored the Sox up at first base, where they were thin. Kroeger now completes the depth chart, for spring training at least, there and in the outfield. His ability to stick on the roster will depend largely on the Sox' health coming out of the spring. Kroeger adds to what is now a crowded situation at first base and in the outfield. His fate likely depends on whether Carl Crawford's health and whether Lars Anderson is dealt before camp breaks. I'm not sure how the Pawtucket roster holds all of Kroeger, Repko, Gomez, J.C. Linares, Che-Hsuan Lin, AND Daniel Nava. Those first three likely come into camp so that the Sox can get a look at them for the Triple-A roster, and for insurance in the case of a trade. Thanks for reading folks. I'll be back next week with an analysis of the non-roster invite list. Chris Hatfield is the Executive Editor of SoxProspects.com. Follow him on Twitter @SPChrisHatfield. Strengths: Vitek utilizes a fluid, mechanically sound swing to drive his hands to the point of contact. He generates easy batspeed via quick wrists and a smooth trigger. Vitek’s hit tool and bat control are his greatest assets at the plate, giving him the ability to develop into a plus hitter for batting average as he continues to hone his pitch recognition in the upper levels of the minors. His inside-out swing is designed to produce high levels of contact. At his best when he is waiting for the baseball to get deep on him, he is capable of driving balls hard from foul line-to-foul line. Vitek comes to the plate with a plan in place to work into counts that allow him to get pitches he can attack and displays the willingness to use the entire field. Possessing a lean body and athletic frame, he has some room to add a bit more muscle as he continues to mature into his mid-20s. While his present power is below-average, he produces a lot of backspin when he squares up line drives. He can grow into producing average-to-solid -average levels of power with continued experience against advanced pitching. Vitek shows solid-average speed on the basepaths, projecting as a runner who can pick his spots to swipe a bag by getting good reads off of the opposing pitcher. His work ethic to get better at his craft has been highly noticeable since signing with the organization, often out early on the field or taking extra practice to improve. Development Needs: Vitek must get more lift out of his swing if he is to improve his levels of in-game power. While the strength and batspeed are there to produce average-to-solid-average power in the future, his swing comes through the hitting zone on a very level plane and his post contact extension is lacking. Learning how to balance producing more arc with his swing, while not sacrificing too much of his contact skills is a key need to project as better than an average overall hitter at the major league level. Vitek also can struggle with how he attacks secondary offerings. He tends to get his hands too far out in front of him to roll over the ball or swing over the top of it. When he is over-committing with his hands, he loses his ability to consistently drive pitches and gets into ruts of constantly pounding the ball into the ground. He should pick up breaking balls better with experience, but work to eliminate his stretches of poor hand separation during his stride is necessary to maintain frequent instances of producing hard line drives against the rising level of competition. Vitek has been manning the hot corner since turning pro with mixed results. While he has been putting in a large amount of time to get better at the position, he is still rough and lacks fluidity at the position. There have been questions as to whether all of the dedication to working on coming up to speed at third base has taken away from some of his focus on hitting. A move to the outfield in the near future seems likely given his lack of naturalness at third and may also allow him to relax to let his overall baseball skills perform. 2012 Outlook: Vitek looks likely to take the next step up the ranks and receive a placement in Double-A to start the 2012 season. This assignment will be a good test for him to make adjustments. With a full season of professional experience under his belt, Vitek should have a much better handle on the caliber of secondary offerings he will see on a daily basis. More comfort against these pitches will help him produce more consistent hard contact at this level. When relaxed at the plate, Vitek is a gap-to-gap hitter capable of driving balls hard on a line. He has the hitting talent to show strong contact rates as the 2012 season unfolds, but will be challenged to bring more consistency to his game by the pitchers in the Eastern League. Vitek may start off slower at the beginning of the season as he feels his way through the competition. I would not expect a large increase in his home run production this year, but for him to have a better understanding of when he can muscle up in favorable counts. A big key to this season is to relax more when playing the game. It will be interesting to see how much longer he ends up playing third base and by the end of the year could wind up playing the outfield. 2012 is a year to show improvement and that he is developing into a future high contact hitter at the major league level. Strengths: Tejeda is a solid athlete who has been growing into his frame over the course of the last couple of seasons. With a whip-like swing, he produces plus batspeed and has improved upward path to the point of contact. Tejeda excels against fastballs middle-in. His quick swing and ability to pull his hands inside the baseball allow him to create strong leverage against these offerings. Tejeda’s power projects as solid-average at the major league level, with the ability to hit around 18 home runs in his peak seasons. Capable of driving offerings to all fields, he extends well against pitches on the outer third to rifle them to the opposite field. Tejeda puts a charge into the baseball when he squares it up. Even when a bit out in front of a pitch, he has the strength to still hit the ball hard enough to find holes through the infield. He shows the knack for being able to get the barrel of the bat in all tiers of the strike zone when he is keeping his weight back. Tejeda has the hitting tool to produce a .275-.285 batting average at the major league level. Defensively, he has the footspeed to cover above-average ground at second base. His plus arm allows him to make off-balance throws and his footwork around the bag turning double plays has been improving. Tejeda displays a lot of fluidity when making tougher plays in the field. Development Needs: Tejeda needs a lot of improvement with his pitch recognition and approach to continue to develop his hitting in the upper levels of the minors. He struggled considerably with secondary offerings in 2011. Often getting himself too far out on his front foot, he could not drive breaking balls and typically ended up producing a lot of weak contact when he put them into play. Tejeda also tends to chase pitches breaking away from him into the dirt with frequency. This accounts for a lot of his swings and misses. He needs to tone down his aggressiveness and learn to be more selective to diminish the amount of times he works behind in the count. While Tejeda has the ability to drive the ball hard to the opposite field, he consistently looks for the ball middle-in and neglects to cover the outside corner of the plate. This leaves him prone to any offering middle-to-away. Tejeda has to look to cover the entire plate and bring a plan to the plate to produce more solid contact against advanced pitching. In the field he shows the ability to make plays at second base, but at times gets poor reads off the bat, especially on balls hit up the middle. He also tends to botch relatively routine plays, but make tough plays look easy. Overall, he lacked focus for extended stretches in the field and at the plate in 2011. He seemed to drift through games and looked stuck in neutral, either giving away at-bats or losing his concentration in the field. Tejeda has a lot of baseball talent, but needs to raise his level of concentration and apply the mental aspect of the game to push his development to the next level. 2012 Outlook: Tejeda is slotted to return to Double-A to start the season and will work to prove that he can be successful against the level of competition. His experience in the Eastern League in 2011 can be a strong learning tool for him to raise the level of his game. If Tejeda can keep his hands and weight back with more frequency, he has the potential to produce a lot of solid contact as the 2012 season gets going. His power numbers should also rise with increased hard contact. As with a lot of young players, Tejeda is going through the learning process of understanding that the mental aspect of the game is just as important as having the physical tools. With more focus at the plate and in the field, he has a strong chance to be a lot more consistent in 2012 and have his talent translate to better in-game production. Although he could end up moving to the outfield, with dedication to his defensive game Tejeda can be adequate at second base and his potential production with the bat can carry him as an infielder. The key for him to project as a major league regular hinges on his maturation with the mental side of the game. This coming season will be interesting for both his development path and future with the organization. Given the composition of the major league roster, options seem limited for Tejeda. He could end up as a trade chip in a deadline deal, if he shows he is getting past his developmental plateau this past season. Minor league mini-camp players and staff are required to report by February 22, remaining minor league pitchers and catchers by March 1, and the remaining minor league position players by March 9. While players are required to report by those dates, many are in camp early. SoxProspects.com's #1 prospect, Will Middlebrooks hinted on his Twitter account that he was there as early as February 6, which would be among the earliest of any players. Middlebrooks was not alone as you can see from this picture from Peter Abraham of the Boston Globe with as many as 30 players in attendance on February 12. Abraham also reported that Ryan Westmoreland is in camp as he continues his recovery from the cavernous malformation in his brain that required surgery in 2010. Abraham says that Ryan Kalish is in camp working out but has not been cleared to swing as he continues to recover from the labrum surgery he underwent earlier this year. Others who were reported to be in camp included Aaron Cook, Felix Doubront, Luis Exposito, Rich Hill, Daniel Nava, and a "big herd of minor leaguers." Brian MacPherson of the Providence Journal notes that Alex Wilson, Alex Hassan, Dan Butler, and Juan Carlos Linares also received invitations to major league camp. In addition to that list, Alex Speier of WEEI adds Doug Mathis, Jason Repko, and Pedro Ciriaco to the list of players receiving invites. Teams usually start with a large list of invitees before reassigning them to minor league camp as it progresses. The Red Sox have also added former Pirate, Yankee, and Diamondback Ross Ohlendorf to a minor league contract that includes a spring training invite. Our own James Dunne provides some more detail on the signing. Alex Speier adds that Ohlendorf has one options remaining and will not reach free agency until after the 2015 season, which makes this signing very similar to that of Alfredo Aceves. The Red Sox will look at him in both starting and relief pitcher roles. Nick Cafardo of the Boston Globe reports Red Sox pitching coach, Bob McClure, said that Junichi Tazawa will start the year as a reliever. There is lots of minor league starting pitching depth after the signings of Ohlendorf, Aaron Cook, Carlos Silva, Brandon Duckworth, as well as Clay Mortensen who came over in the Marco Scutaro trade and younger options Alex Wilson and Felix Doubront. This will give Tazawa the best chance to impact the major league roster at some point in 2012. It seems Red Sox catching instructor Gary Tuck is not in camp because of physical issues according to Nick Cafardo. Tuck is widely regarded as one of the best catching instructors in the game, and his absence certainly does not help the preparation and development of Jarrod Saltalamacchia, Ryan Lavarnway, Luis Exposito, and the rest of the Red Sox catchers. Hopefully it is nothing serious and he can return soon. This year Chris Mellen continues with his Prospect Previews column every Monday, Wednesday and Friday leading up to opening day. Each one covers two prospects looking into their strengths, developmental needs, and 2012 outlook. Thus far they have included: (1) Madison Younginer/Jordan Weems, (2) Williams Jerez/Heiker Meneses, (3) Reynaldo Rodriguez/Kendrick Perkins, (4) Jeremy Hazelbaker/Brandon Workman, and (5) Cody Kukuk/Henry Ramos. The Red Sox released their spring training schedule for their minor league affiliates. Note that this is the schedule for the Triple-A and Double-A clubs. The A-Ball and Rookie-Ball squads will play the same schedule, but will simply be away against the same opponent on the days that the Triple-A and Double-A clubs are home, and vice-versa. Peter Gammons is reporting the Red Sox have signed right-handed pitcher Ross Ohlendorf to a minor-league contract. Peter Abraham of the Boston Globe confirms that Ohlendorf has reported to Fort Myers and that he has been invited to major league camp. Ohlendorf, 29, was originally drafted in the fourth round of the 2004 draft out of Princeton by the Arizona Diamondbacks. He has major league experience with both the New York Yankees, where he pitched primarily in relief, and Pittsburgh Pirates, with whom he was a starter exclusively. Ohlendorf has a career 14-28 record and 4.77 ERA. His best season was 2009, when he started 29 games, going 11-10 with a 3.92 ERA and compiling 109 strikeouts over 176.2 innings pitched. In 2011, Ohlendorf struggled with injuries and ineffectiveness. He left his second start of the season in the third inning due to a recurrence of the right-shoulder posterior strain that had caused him to miss the last six weeks of the 2010 season. While the injury did not require surgery, Ohlendorf did not return to the Pirates until late August and struggled upon his return, reaching the sixth inning in only one of his final seven starts. He finished 2011 with an 8.15 ERA and 9 home runs allowed in only 38.2 innings. Strengths: Kukuk has an athletic body and a frame that can add more weight, especially in his lower half. He generates easy velocity via a smooth, balanced delivery. Kukuk’s fastball sits 91-93 MPH and can touch up to 95 MPH when he reaches back. Showing late, arm side tail and downward finish, his heater runs away from right-handed batters or jumps on the hands of lefties. He hides his fastball during his delivery and hitters tend to be late given the velocity. Kukuk also features an 81-83 MPH slider. With tight, hard break, the offering disappears sharply out of the strike zone when he snaps it off and stays on top of the ball. This offering should evolve into his go-to out pitch and one with which he looks to pick up swings-and-misses. It has the makings of a plus pitch at his disposal. Given the loose nature of how he throws, Kukuk does not expend extra energy during his delivery. With natural physical maturation, he should develop the stamina necessary to stick as a starting pitcher and be able to go deeper into games as he does not wear himself out or strain to create his velocity. Kukuk has the ceiling of a second or third starter at the major league level. Development Needs: Kukuk can struggle with his fastball command, mostly because he tends to release the heater early in his delivery. He arches his back and will land too soon, causing the ball to come out of his hand high. This drives his fastball to sail up and out of the strike zone. Kukuk needs work repeating the optimal timing of his delivery and locking into a consistent arm slot. Early in his career, he is most likely going to show stretches of wildness due to this and will have to learn how to recognize when he is out of whack so he can correct himself. Kukuk is also in the early stages of learning to throw a changeup. It presently looks more like a fastball he is taking something off of. Gaining feel for this pitch through repetition is important for him to expand his repertoire. Kukuk must first find trust in this offering so he can start to work it into sequences against opposing batters. The progress he makes with this pitch over the next couple years of his career will be a strong factor as to whether he continues to project on the path of a starting pitcher. 2012 Outlook: Kukuk did not pitch professionally in 2011 until the Fall Instructional League. While he showed solid, raw stuff, he looks most likely to stay back in Extended Spring Training and then start his first pro season with the Lowell Spinners. This assignment will be good for Kukuk to ease into game action and allow him to continue working on repeating his arm slot to enhance his fastball command in an instructional environment. Early progress in Extended Spring Training can show during the season in the New York-Penn League. Kukuk has the stuff to be ahead of the hitters and if he is throwing strikes he can get solid results. The inexperienced hitters tend to be overmatched by pure stuff and also tend to miss a lot of pitches. The area to focus in on is where he is placing his fastball. Consistently living down in the zone is a good sign that Kukuk is starting to finish better out of his delivery. Fewer instances of wildness are also positive markers that he is not landing too early. I feel his changeup will continue to show as a below-average offering during the season, but as the year goes along it should start to mix more and more into sequences. 2012 is a year for Kukuk to begin polishing his stuff and get used to the routine of a professional starting pitcher. By the end of the year, he should prove to be ready for his first full-season placement with Greenville in 2013 and also begin to push as a rising young arm within the Red Sox system. Strengths: A converted soccer player, Ramos has shown a quick transition to playing professional baseball and earned a promotion to A-Ball out of Extended Spring Training in 2011. Bolstered by a powerful, athletic frame, he unleashes a smooth swing from both sides of the plate. Ramos generates above-average batspeed and can drive balls hard on a line with backspin. His raw power grades as plus and he has the swing path to produce 20-25 home runs as his hitting skills develop. Ramos’ swings from both sides of the plate are mechanically sound. He has the hit tool to also be able to produce the contact of an average-to-solid-average hitter for batting average. He covers the outside corner of the plate well when hitting left-handed and can get the head of the bat on pitches in tougher spots. Ramos has the defensive ability to play all three outfield slots presently and slots in as a corner outfield as his body fills out more. His plus arm profiles well in right field. He has the ceiling of a regular right fielder at the major league level, with the potential to hit fifth or sixth in a deeper lineup. Development Needs: As expected, Ramos’ overall game is raw. He struggles to pick up secondary offerings, especially curveballs and sliders in the dirt. He is also very aggressive at the plate, lacking a plan of attack and the confidence to hit with a strike or two on him. Ramos typically goes up to the plate looking to hack at the first fastball he sees. Once behind in the count, he becomes defensive due to his lack of comfort seeing breaking balls and leaves himself prone to fastballs because he is hesitating with his swing. Ramos has very good batspeed, but gets behind fastballs when he is trying to protect against off-speed stuff. He can also lunge across the plate too much and allow higher velocity fastballs to eat him up on the inner third. Developing plate discipline will be necessary for Ramos to allow his natural hit tool to produce consistent, hard contact. His pitch recognition should improve with experience, but it will take dedication to learn to sit back more on offerings. Ramos is also still learning to slow the game down, especially defensively. He can rush or be over-zealous in the outfield when tracking flyballs. His reads can also be rough. 2012 Outlook: The organization was aggressive with Ramos last season and he surprised by sticking with Greenville for the entire season after his promotion in late May. Spring Training will be a factor, but he could likely use a return assignment to the South Atlantic League to continue honing his pitch recognition and plate discipline. A year more experienced, Ramos has a better foundation for understanding how to work to get ahead in the count. Improvement with this area of his game will lead to stronger overall contact for him in 2012. Most, if not all, of his offensive progression is tied into this aspect. Ramos can also begin to show more game power with rising contact rates. He has the ability to drive balls with very good backspin and getting better wood on offerings will lead to more instances of hitting drives with carry. Ramos will still show patches of inconsistency in 2012, but I feel he has the chance to make strong strides this season. He has shown to be highly coachable and displays a solid work ethic, in addition to his aforementioned tools. Ramos is an intriguing prospect to follow within the Red Sox organization and one that can show how the depth in the lower levels is starting to come into their own in 2012.